I was looking for something that looked more authentic to go with my 1840's outfit. My Cold Steel looks too modern. Frankly, I think it is a casting, not a forging. 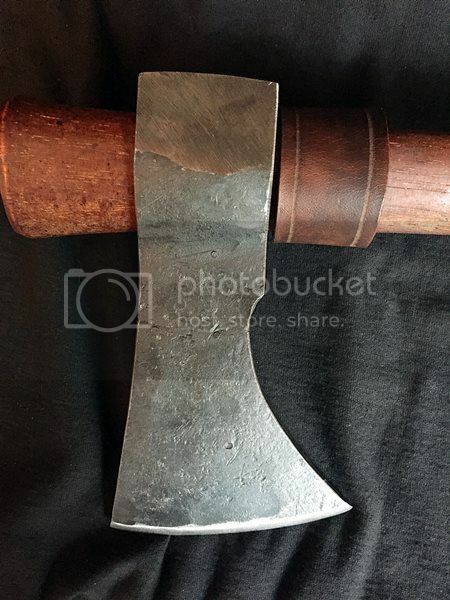 So I got onto HatchetsandAxes.com and found this one for $33.95. The stained haft was an additional $7.95 and shipping was $10.00. 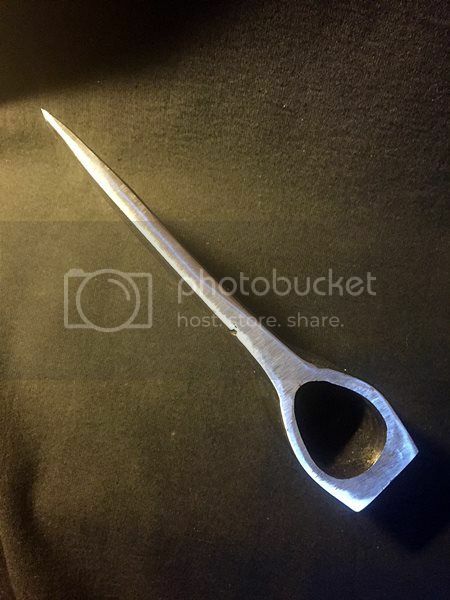 It appears to me to be hand forged (I can see the lap weld near the eye). I find the gratuitous application of random hammer marks to be totally un-necessary and probably just an effort to make it look more primitive. Whatever. 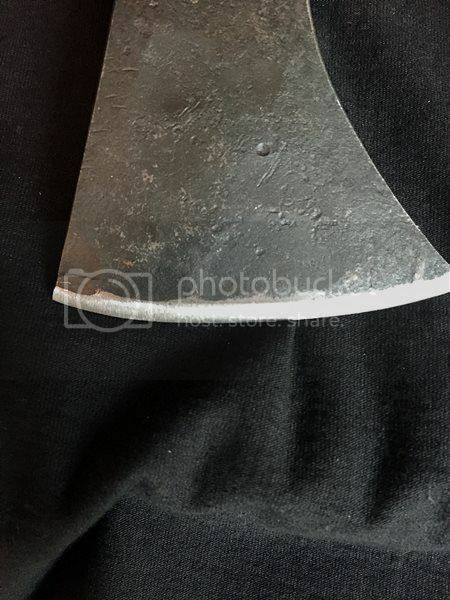 The edge was not great but some time with a file and a stone got it sharp enough to cut feather sticks. I don't plan to shave with it so I did not take it that far. I weighs in at about 2 lbs which is a bit heavier than my CS Hawk. It is not an H&B hawk but it costs half as much as an H&B hawk. It will suit my purposes just fine. Not a bad lookin' tomahawk. Hopefully you can give it a little workout to see how it holds up to impact, please. Got a top view handy? Looks good to me. I just got a CS frontier hawk from JTD and am liking it. Looks like he smoked the haft on it and in my opinion, really improved the looks. I like yours a lot too. I'll see if I can grab a fallen limb to chop on. All my wood to go camping with has rotted away. I will say this one has more heft than my Cold Steel hawk. I like it, too.......polled 'hawks may not have been as 'common' as the simple folded or wrapped teardrop shaped socket, but they are infinitely more useful. I've never really liked hawks. Growing up we used axes, mauls, chainsaws and FINALLY a splitter. As I've aged and have become interested in edge tools I'm seeing and using more of them. I guess I have a half dozen or so now. I see them more as a weapon. Not a bad thing. !50 years ago I'm sure I'd have several. The problem I have is the "vs". the ax thing. The hawk was used as a trading tool with the natives. Cool things were the flash of the moment and the natives loved metal stuff. If you were going to war you used a hawk, if you were going to stay warm you use an axe. I'm glad I've been able to appreciate a few now. Any thing sharp and throwable is good. I like your new one Q. Post a beauty pic in axe pics please. This is a throwing hawk but the poll extends its usefulness. It is heavier than my CS polled hawk. With some extra weight, I Would expect it to do a bit better as a chopper. I will get a better photo tomorrow. OK, here's an update. Upon more careful examination, I noticed tiny weld BBs around that line that can be seen about half way between the bit and the haft. That line is an undercut from an arc weld that was not well executed. While it may never crack in use, you would not want it to shatter and hurt someone. 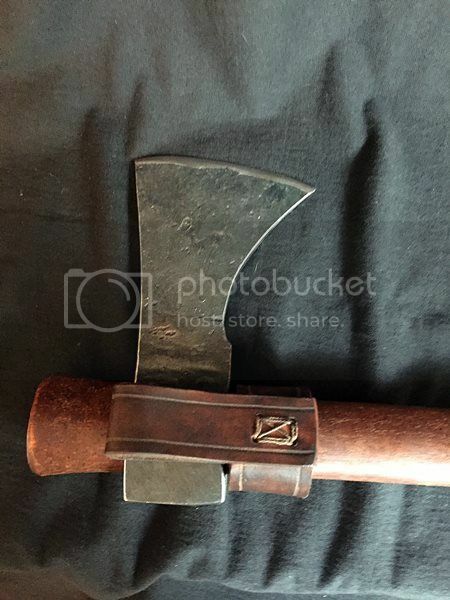 I contacted the company that made it (HatchetsandAxes.com) and sent photos. I immediately received an email response with an apology for my receiving a less than perfect hawk. They will be sending a replacement at no charge. Good eye, Bob.....did you use a jeweler's loupe? No, I have my own loupe. You can see the undercut in the photos. The divot was full of scale and I did not notice it at first. That undercut is a stress concentrator and could crack at low applied stress. Didn't put enough flux down, saw it right off. Not that it really matters, basically they take the two parts and weld them together by some means other than hand forging? 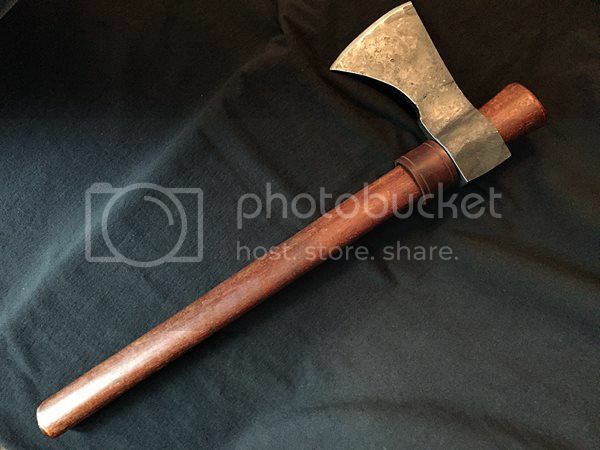 Unk, it looks like the poll and eye are forged by a smith by traditional means but the front half of the hawk is made from higher carbon steel as a 2x4" plate. The two sections ar arc welded together and finish forged to shape. That is just my guess as they did not reply to my questions about how it was made. A good arc weld can be the strongest part of the forging if they use the right rod and execute the weld properly. Fot the new hawk head today. Big improvement in the fit and finish. Since I didn 't have to return the old one, I may try to grind the surface to clean it up some. I also still have the original, unstained haft.